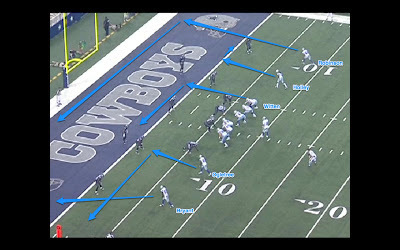 The Following is the 9th in an 11-part weekly series throughout the summer that will focus on the eleven plays that shaped 2011 for the Dallas Cowboys. Every game, about 130 actual plays happen and over the course of a season that number can exceed 2,000. But, we have selected 11 and will pick one each week and break it down from standpoint of "X's and O's" and see what we can learn looking back. The plays are not ranked, simply presented as the season unfolded. We hope you enjoy. Parts of this post first appeared on December 8, 2011. Blitzing, and more specifically, fire zone blitzing is a staple of the Rob Ryan defense. We have discussed this at some length in past entries, but usually it is when it works to perfection - such as the study we did when he had Buffalo all confused back in November. But, of course, sometimes when you blitz, the other team has figured you out from their film study or they just lucked into a perfect call at a perfect moment. Regardless of how the Cardinals walked the Cowboys right into a trap on the final play of Sunday's game, the truth is on the film for all to see. Larod Stephens-Howling is known as the "hyphen" in Arizona, and surely is one of those water-bug types that if they can get into the open field, the opponent is going to have a hard time containing him and bringing him down. Another note worth considering is that the Cardinals have a notoriously difficult time executing screen plays. Perhaps that is why the Cowboys felt that this was not going to be a major issue entering the action on Sunday. The Cardinals are on the 1st Drive of OT, and are facing a 1st and 15 after a penalty. The Cowboys scheme for fire zones vary, but just know that it means the Cowboys are overloading their blitz to one side of the field, while the weakside edge LB will drop into a zone instead of rushing. In this case, that LB is DeMarcus Ware, and the normal genius of such a concept is that the opponent has 2 guys assigned to block #94. So, the premise is simple: Blitz more guys from one side than can be blocked, and rush almost nobody from the other-side which leaves the LT and sometimes LG just standing there with nobody to block. 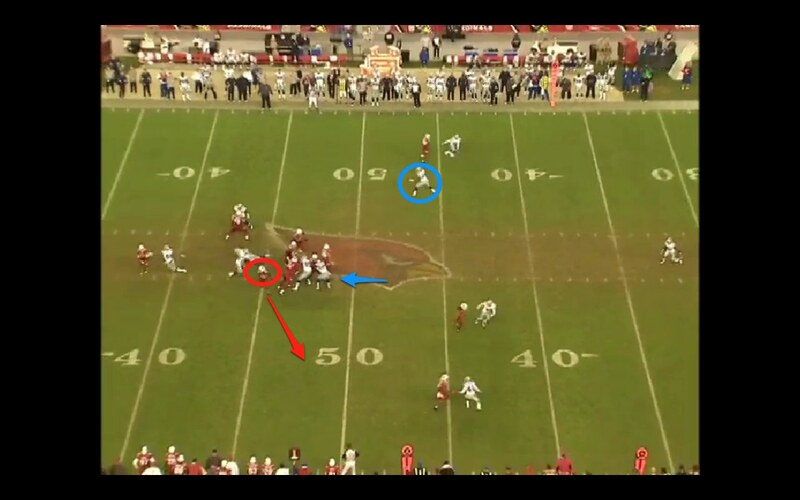 From the Cardinals standpoint, if they can somehow have a play on that attacks the blitz side, it can go for miles (which it did). If they call the screen to the opposite side, Ware will be standing there and ready to devour the play as he will be unblocked. The Cowboys are trying to drop 2 LBs (94 and 56) into the shallow zones on either side. 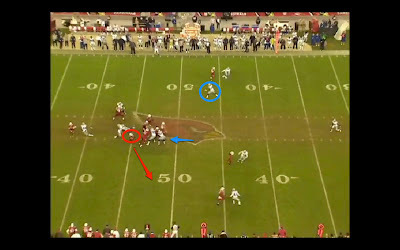 Of course, Bradie James is highlighted in green on the diagram (and is standing on the Cardinals logo on the film) because it is rather clear that he busts on this play and gets "caught up in the wash" as he tries to get out wide to the side that the play is about to go. With Sensabaugh and Newman in man coverage, they will have their backs to the play for most of the play, so this is Bradie's play or likely nobody. 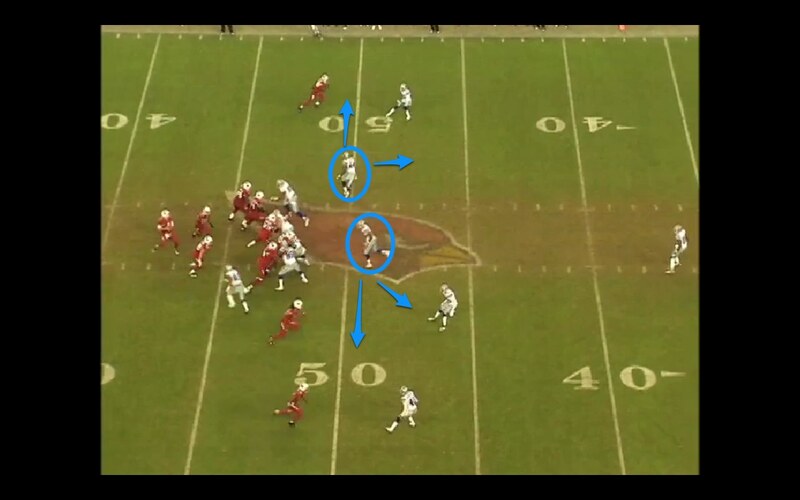 Notice Sensabaugh - highlighted below - asked to man up against Fitzgerald on this play in the slot. This is why pressure is going to be key, because the Cowboys know that asking Sensabaugh to run with Fitzgerald if Kolb gets time is a very bad idea. Also, let's note that the defense must be aware of who is on the field at each position. A specialty player like Stephens-Howling is a wrinkle that might burn the defense if they are not prepared for it. Keep in mind, in 59 snaps before this play, Beanie Wells was the RB on 40 of them, Chester Taylor had 6 plays, and Stephens-Howling just 7. What are the keys for the linebackers when he sneaks out there? Is he a decoy? Or is he a legitimate target in a key spot? The Cowboys are about to find out. Picture #3 goes along with the diagram above. Notice the drop responsibilities for Ware and James. James has a longer way to go and if the hyphen gets to the edge, there is big trouble. So, if they have the screen to his side called, there is going to be a footrace between the Cardinals fastest player and the Cowboys slowest linebacker. 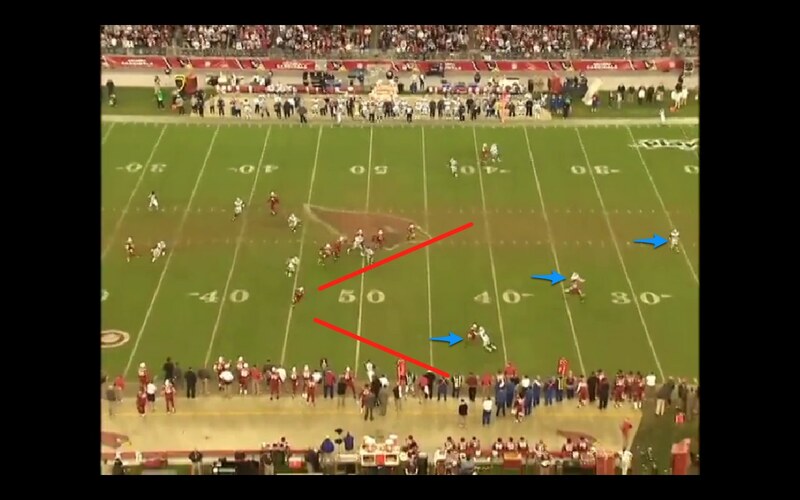 The Cardinals do not even attempt to block Anthony Spencer which is either a horrible decision if Spencer can grab Kevin Kolb or a brilliant one if Kolb can slip past 93 long enough to dump the ball off to hyphen in space. It works like a charm. This demonstrates why mobility for a QB has almost nothing to do with "straight-line" speed and more to do with understanding how a side step can buy you another few tenths of a second. Now, the moment that causes the issues is shown in Picture #4. Let's credit #70-Rex Hadnot, the Cardinals right guard, for getting a very impressive hold on James that keeps Bradie from getting to where he is supposed to go on this play. Holding for a split second on a screen play is often done and seldom called. But, if you can throw James off of his route to the flank by disrupting him for a moment, the damage is done. Also, we should perhaps blame Bradie for attempting to get too cute as he tries to give the impression that he is blitzing. It is a good bluff in some scenarios, but in this one it cost the game. The concept is for Bradie to occupy a blocker with his first step or two, but he has to bail before anyone can get their mitts on him because he has that entire half of the field on the defensive left. It is going to be a long run with no contact, but once Hadnot touches him, this play is doomed. At the moment Picture #5 is taken, here is Picture #6 from the long angle. Look at what Stephens-Howling is seeing. He knows he will not be caught from behind and ahead he has 2 blockers for 3 Cowboys defenders. And, unless Newman can defeat his man, the only other threat is Abe Elam who is 30 yards down field. Surely, Stephens-Howling knew that this was a touchdown the second he looked downfield. Sean Lee is a very fast inside LB, but at 4.6, he is no match for a 4.35 guy like Stephens-Howling. Lee diagnoses the play and peels off as fast as he can (and is actually quicker to get there than James), but he will not be able to run him down from behind. James just cannot get there in time, and as you can see, Sensabaugh has his hands full worried about Larry Fitzgerald and is running with his back to the play. From the time of the catch, the play is doomed. The Cowboys only real hope is that Terence Newman can get around Andre Roberts to bring down Stephens-Howling near the 45. Once Newman is dealt with quite easily, it becomes a comedy of missed tackles and less-than-inspired efforts to bring him down inside the 20 which speaks to the knowledge that the game is already lost once the play goes deep inside FG range. You can see full video of this play here. Is it a horrible call from Rob Ryan? This is the nature of all of football. Call a blitz on 1st Down when few would expect it is a great idea when it works (a sack is a drive ender if the Cardinals are looking at a 2nd and 22)- and a horrible plan when it fails. Asking Bradie James to get to the flank in time against Stephens-Howling sounds like a very poor plan, unless you are playing the odds that the Cardinals hadn't used him hardly all day long. One does wonder how a speedy inside LB like Bruce Carter would do in the same situation, and we will get to find out in 2012. So, perfect call against your blitz or reckless play call from Rob Ryan? It is a results-based business, so in this case, Ryan was caught with his hand in the cookie jar and his players were unable to bail him out. This is why blitzing is a fine art. If you call it right, you cause a big play. But, one false move and you concede a game that will potentially keep you out of the playoffs. At 1st and 15, the Cowboys might force a punt from midfield and have another chance to win the game. But, in this case, it was a fitting end to a day where coaches and players alike seemed a step behind. Next Week: The season is lost in the lights. As we spend 2 weeks at Cowboys Training Camp in Oxnard, California, I will continue doing the regular features on this very Cowboys-heavy blog (11 for '11 and Splash Plays), but now we will begin analyzing position battles and other more relevant training camp issues. One I wanted to tackle today was something that won't get near the ink of the fictional "window" of the Cowboys or the handling of Dez Bryant, but it is far more interesting to me than either of those well-discussed items. That is, how well will the Cowboys tackle position be fortified with the flip-flopping of Tyron Smith from Right to Left tackle, and Doug Free going the opposite direction? How can a rookie hold up against the gauntlet of studs that will come his way on Romo's blind side, and just as important how will Free respond to having a very difficult year at left tackle in his 1st season under his new hefty contract? My question – Everyone raved about Tyron Smith last year and criticized Free. To me, it looked like Smith benefited from having Kosier next to him…..and Free was a little more lost without Kosier. Free had a good year with Kosier next to him in 2010. What do you think? Jerry Jones and I have a large philosophical difference in opinion when it comes to football it seems, and I have noticed this since I have started covering his team in 1998. It appears that he places a premium - whether in money or in draft picks - on skill position players well above players on the two lines of scrimmage. Whereas, aside from the obvious position of Quarterback - I feel the exact opposite about the game of football. I believe, even in 2012 where there is more passing than ever, that this is still a game that is usually won by the team with the better pass protection and ability to destroy their opponent's pass protection. The greatest example of this is the Giants, despite uneven QB play for large swaths of the last 5 years have managed to win 2 Super Bowls, largely because they have been able to generate a dominating pass rush group that never seems to need a blitz in its attack. When you can easily drop 7 men in coverage, then you don't have to have great defensive backs - and they don't. They simply enjoy a rotation that reduced Aaron Rodgers to a poor facsimile of himself last January. Regardless, as Jerry Jones has continued to spend his most important assets on defensive backs, wide receivers, and running backs, I have spent a lot of time typing protests on this blog about the fact that the Cowboys need to invest in their lines more. They need to help DeMarcus Ware destroy passing attacks and they need to give Tony Romo a chance by being able to hold off the Giants pass rush. RT - Tyron Smith - 641 pass plays - 8 sacks: A world of expectations have been placed on Tyron Smith, and he took every single snap he could this season at right tackle. From day one, teams tried to confuse him with stunts and blitzes to make his rookie head spin. He also was victim to some old tricks with one pass rush move setting up another. He had Calvin Pace beat him in Week 1, Ryan Kerrigan in week 3. Willie Young bull rushed him on to his back to end the Lions game, Andre Carter went clean around his flank in game 5. Then Jason Babin used two inside spins to get him in Philadelphia and Trevor Laws stunted around him to get a 3rd in that forgettable night against the Eagles. But, here is the great news. Starting in the 2nd half of the year, as the rest of the line was crumbling, Tyron was figuring it out. Kerrigan got him again in Washington and Michael Bennett did get his flank in Tampa Bay, but that was it. All of the troubles against the Giants were not because of right tackle. In his first 7 games, Tyron game up 6 sacks. In his last 9 games, he only conceded 2. His upside is immense and he is only getting better. LT - Doug Free - 641 pass plays - 10 sacks: Free started the season very well coming off his new contract. In the first 4 weeks of the season, Free was not involved in hardly any situations that led to sacks. Andre Carter went around his edge in New England, as did James Hall of the Rams, and Trent Cole of the Eagles. There was one blitz awareness issue in the game at Washington that led to London Fletcher's sack, but otherwise a very strong month of November. But, in December, Free was just beaten over and over again (6 of his 10 sacks in December). In fairness to Free, Jason Pierre Paul was dominating the rest of the league, too, but against the Giants and JPP, Free was eaten alive. 4 sacks in 2 games just from the left tackle spot and Trent Cole got him again in Dallas. In all, I had Free as the primary blame in 10 sacks this season, but with 2 against Cole and 3 against Pierre-Paul (and 1 more against Chris Canty) meant that 6 of his 10 sacks allowed were against the Giants and Eagles. Free sees the toughest match-up nearly ever Sunday, so, I am not here to suggest he is doing a lousy job, but it does appear that he might be more of a right tackle in the long term. So, as we head to 2012, the decision has been made on the switch. The Cowboys did the right thing in getting Smith a year under his belt before throwing him to the 2nd most important position on the offense. This assignment should not be taken lightly and it won't be. The NFC East is a spot where there is no place to hide for either tackle. The edge rushers in the division are awesome. In New York, it is Justin Tuck and Jason Pierre Paul. In Washington, it is Ryan Kerrigan and Brian Orakpo. And in Philadelphia it is Jason Babin and Trent Cole. Not only that, but now the interior of those defensive lines are improving as well. Fletcher Cox will join Cullen Jenkins on the interior in Philadelphia. And the Giants will add Shaun Rogers and Marvin Austin returns from missing an entire year. How the Cowboys continue to avoid major investment on their offensive line's interior suggests to me that they didn't watch much of last December's game tape. That is the only explanation that I can come up with, because I still believe guard-center-guard is a major place of concern for a team that could have fortified that substantially with the 2012 draft. 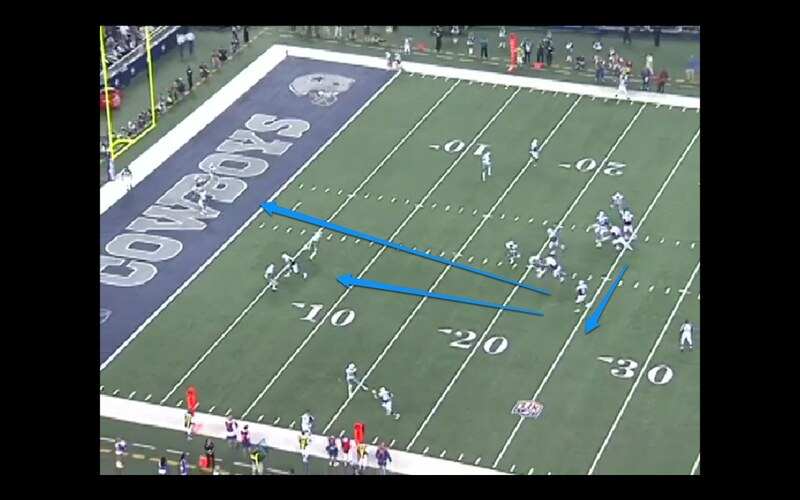 Instead, they took a very talented corner and hope that what they have is good enough in front of Romo. Back to Bob's email. Did Tyron benefit from having a better guard next to him than Free did? Well, what is interesting is that Free's play was better when Bill Nagy was the left guard. Nagy was really struggling and the position improved when Montrae Holland was brought in to replace him after his injury. And in December, Free was just over-run with a pass rush that had exhausted him. Smith, meanwhile had a clean December which says quite a bit given what was happening all around him. I think the caliber of the guard can affect the tackle, but for the most part, it is line calls and blitz pick-ups more than it is the ability to simply stay in front of your man. I don't think Kosier was helping Smith very much blocking-wise. It appeared that they took the training wheels of Smith early and left him on an island. With his long arms and great recovery, he showed he had great quality. But, let's not kid ourselves. Left tackle is harder to play. There are fewer occasions where you have a tight end next to you. And, with Trent Cole, Brian Orakpo, and Jason Pierre Paul usually over there, it is a harder assignment. He also will see plenty of Julius Peppers and James Harrison when those teams come to Arlington. He will get beat this season. But, I think he will emerge quite well, because he is that good. Free, on the other hand, will have to rebound. His confidence was not done any favors last December. And, even though right tackle is not regarded the same way, in today's NFL, the good teams have two edge rushers and the right tackle is going to have to deal with Ryan Kerrigan, Justin Tuck, and Jason Babin. And if you think that is a picnic, you need to watch those players more often. I am curious about how Romo deals with all of this. As we have seen on the blog in the last few weeks here and here, Romo was starting to hear footsteps quite a bit and he would bail out of the pocket before he had to on some occasions. It appeared he was expecting Free to lose his battle rather than wait for Free to lose. So, he was spinning away and actually making some of his best throws of the year, but to run an efficient offense where you can spread the ball around, you have to believe in your protection. I am curious if this adjustment will actually result in Romo being able to sit in the pocket a bit longer and be able to find something downfield that turns into a nice gain. It all looks good right now, but 37 days from now in New York that will certainly be tested. Last week we introduced the concept of the splash play, and began rolling through 2011 again to demonstrate what we are talking about from Weeks 1-4 on the schedule. If you missed it, this might all make more sense if you check it out by clicking here. In a nutshell, I am unsatisfied with our current metrics for evaluating defensive players and wanted to try something new this season. Tabulating and evaluating "splash plays" is an idea that is worth trying, and although there is subjectivity involved, I suppose that is not that different than just about every other way we attempt to evaluate the Cowboys. I think Phil Costa had a lousy 2011. The Cowboys obviously did not since they try to replace him very hard. I feel I have my evidence that is both objective and subjective. They clearly have theirs (he was too young, he did not have enough help, he is developing) as well. But, to act like anything in football besides the final score and the final record of the teams we follow is 100% objective analysis is likely missing the boat. But, on this blog in particular and most Cowboys coverage in general, we spend a ton of time on the offense and not nearly enough on the defense. So, this year, I plan on a weekly analysis of "splash plays". And according to the jargon in the NFL, a splash play is basically a play for the defense where somebody steps up and does something. So, there you have it. This week, we are doing part 2 of our 4-part review of the 2011 season. Below, I have covered 4 games in this particular edition, from Game #5 (New England), #6 (St Louis), #7 (Philadelphia), and #8 (Seattle). From these 4 games, I have tabulated each snap and have awarded splash plays where appropriate. Then, we are adding them up and combining them with the findings from Part 1. Before long, we will have all of 2011 charted and have a good sample size for which to enter 2012 with some basis to work with. I am quite interested in your feedback about how you see these charts and how you might make them better by improving this project. Please feel free to email me at Sturm1310@me.com and we can grow this properly by checks and balances. 55 splash plays were awarded in these 4 weeks and 57 in the first 4 weeks for a total of 112 in 8 games (14 per game). Sometimes there are more and sometimes, like the Sunday night game in Philadelphia, it is less. Now, we want to reveal through 8 games of 2011, the team leaders. We must account for games lost to injury, and here is the list of games missed: Sean Lee missed games 7-8. Mike Jenkins missed game 8. Jason Hatcher missed 4-6, Terence Newman 1-2, and Orlando Scandrick missed 2-4. Bruce Carter did not play until Game 8, missing 1-7. As you can see, DeMarcus Ware is starting to open up quite a gap from his closest competitors in this category. He had a ridiculous performance at Philadelphia when pretty much the rest of the roster stayed home. I credited him with 7 splash plays in that one game alone, and the entire team had just 9. The chart above lists 13 members of the defense and there are plenty of observations to draw, but the names not on the list are the names that are most disconcerting to me. Keith Brooking and Bradie James each had just 1 play in 8 games that seemed worthy of noting. That is beyond shocking. Marcus Spears had just 2 plays that were noticeable. Gerald Sensabaugh had only 3. That is 4 players of large salaries and responsibilities on the 2011 team that were almost never even noticed through half of the season. Brooking and James have been dispatched, but the idea that Spears and Sensabaugh are likely opening day starters in 2012 is a bit of a mystery to me. I think Sean Lee would be much closer to Ware had he not missed that action with his thumb injury, but he will return in Game 9. And perhaps Anthony Spencer will get a bit more credit after this project, because he blows a lot of plays up and even though his sacks aren't there, you do see him every game doing something. Next week, we tackle November and weeks 9-12. Keep the feedback coming. According to a multitude of reports, Monday marked the day when the Cowboys agreed to terms with their top pick (and only pick in the top 80) of the 2012 NFL Draft, Morris Claiborne on a 4 year/$16.4 million dollar contract which will get him to camp in plenty of time to help the cause. The Cowboys now have $66 million and change invested this offseason to insure that the starting cornerback duo at the start of business 2012 is both new and improved with the picking of Claiborne and the signing of top free agent corner Brandon Carr from the Kansas City Chiefs. That cash outlay has certainly been discussed, but as we have been distracted in this city by the employment fates of Tyson Chandler, Deron Williams, Josh Hamilton, CJ Wilson, and Yu Darvish, I am not sure enough has been made of the $50m investment in Carr. Hard to believe a Cowboys' headline has been overlooked, but it appears in that case, it has. Regardless, thanks to the new Collective Bargaining Agreement in the NFL signed in 2011, the signing of rookies - especially the top of the 1st round rookies - has become painfully simple and quite honestly, a much more sensible endeavor for the owner's and management of any NFL team. The truth is, the difference in deals has changed dramatically. And it needed to change dramatically. The player's concessions included guaranteed contracts and shorter durations, but the owners are no longer feeling like they would rather trade out of the top of the 1st Round altogether rather than make their picks and have to pay the "going rate" for the #1 pick or a pick in the Top 10. In the past, agents have properly just worked off last year's top pick and factored in the 10% raise for inflation or whatever they would make up and kick a $40m deal up to $44. Then, to $49 the next year. And up and up it went. In 2010, the #1 pick in the draft was Oklahoma QB Sam Bradford, going to the St Louis Rams. As you might recall, one of the main discussions about whether or not a QB should turn pro early in 2010 was to slip in under the "Old CBA", because when the NFL shut down for negotiations, one thing that the owners wanted and that the players were not going to fight them on very hard was the idea that rookies were making too much money before ever taking a snap. The argument for the owners was not to keep that money, but rather, to pay players with it - just not players who are rookies. Pay veterans that money makes more sense than giving the money to someone who has never done a thing and may never do a thing in the NFL (read: JaMarcus Russell). Bradford's rookie contract turned out to be a 6-year deal, worth potentially $86m, with $50m guaranteed. And when his deal was done, his deal dwarfed Tom Brady and Peyton Manning's deal. And nobody would argue that this was a good idea. So, it changed. And when Andrew Luck agreed to terms with the Colts on his first contract for 4 years and $22 million - all guaranteed, it was noted that he was a rich man, but not comically rich by NFL standards. To achieve that, he would have to spend the next 4 years proving his worth. Then, and only then, would his deal - which under the new CBA would surely have been over $100 million - get to silly standards. All of this is a good step for the NFL. But, what is my Cowboys angle for the day? I wanted to look at Claiborne, Tyron Smith, and Dez Bryant through the scope of reality versus fantasy when it comes to rookie contracts. With Dez Bryant most recent controversy, many of you have asked about the details of his contract and when the Cowboys will be expected to pay him crazy money in his next deal. Dez's contract - under the old CBA - calls for 5 years at nearly $12m, with over $8m in guarantees. As the 24th pick of the 2010 draft, he is under contract for that extra 5th season, and will hit free agency after the 2014 season. That is the same year that Tyron Smith will need his new deal, because Tyron, the 9th pick of the 2011 draft, inked a 4 year deal worth $12.4 million - fully guaranteed. So, you see the concessions in the new deal - fewer years to free agency, more in guaranteed money, but much less in the value of the full contract. So, Claiborne is free after 2015, with Smith and Bryant (and Sean Lee) hopefully needing giant extensions at the end of 2014. As a team, you hope they are worthy of giant extensions when their time comes, because that means they have turned into key members of your team. So, from the handbook of building from within, remember - you WANT to sign players to lucrative extensions for huge money. You DO NOT WANT to have to draft their replacements before their rookie contracts expire. We like to fantasize on draft day about the longevity of a 1st Round pick as it pertains to his new team. Who among us didn't claim that "if you take Tyron Smith, you won't have to worry about left tackle for the next decade". And that is the hope. But, how often has it been true around here? 2009: There was no 1st Round pick (Roy Williams trade). Players in this draft would roughly be 25 or 26 years old right now, and the heart of the roster. 2008: This was the year the Cowboys ended up with 2 1st Round picks. Felix Jones signed a 5-year, $10.25 million deal, and Mike Jenkins signed a 5-year, $9.27 deal that would make them both free agents after the 2012 season. The Cowboys have both of these 1st rounders on the roster today, but in the case of Jenkins, the chances of him being on the opening day roster should be at about 50/50 and the feelings of either locking down another lucrative contract by the end of this season should hardly be considered a lock. Both players have had replacements drafted at their position and currently above them on the depth chart. DeMarco Murray has appeared to have taken Jones' spot and Claiborne has surely replaced Jenkins. So, from the standpoint of "locking down their spot for 8-10 seasons, neither player appears to fit that bill. 2007: This is the year the Cowboys traded out of the 1st Round in the Brady Quinn pick in Cleveland (speaking of locking down a position for a decade) and then trading back up into the 1st Round to get Anthony Spencer from Purdue with the 26th pick of Round 1. He, too, signed a 5 year rookie contract valued slightly under $7.5 million dollars. When it came time last winter to offer him a long term extension - LaMarr Woodley of Pittsburgh was selected after Spencer at the same position and after being wildly productive, signed a 6 year/$61m deal last season - the Cowboys passed on such expenditures and slapped a franchise tag on him at a much less risky 1 year/$8m to continue his career here with no long term commitment. Knowing that it will cost them around $40m to extend Spencer long-term, very few people expect that to happen this season given Spencer's lack of sack production. 2006: Bobby Carpenter was the selection with the 18th pick in the draft out of Ohio State. He was quickly inked to a 5-year deal worth as much as $11 million, with over $7m in guarantees. To say this was a bust is an understatement and almost unfair to marginal busts like Mike Jenkins or Julius Jones. He is credited with 3 starts in 4 seasons in Dallas and as he is approaching his 29th birthday, is one of the players who should be part of the spine of the Cowboys defense in 2012. But, alas, he is hoping to make the Patriots roster which would be his 5th team in 4 years. Given he didn't last his entire rookie contract, there is nothing to discuss with regards to the Cowboys decision about an extension. 2005: The 2005 draft had the Cowboys in the 1st Round twice due to trading out of the 1st Round in 2004. They selected DeMarcus Ware with their own pick and paid him a rookie deal of 5 years and $13m. Then, as his 5th year voided, the Cowboys placed a giant extension on Ware of 7 years at $79 million that would carry him from 2009 to 2015. Ware is without question the best 1st Round pick this franchise has selected since Emmitt Smith. Meanwhile, with Buffalo's traded pick, the team grabbed Marcus Spears. Spears signed a rookie deal for 5 years at $9.35m back in 2005 with a team option for a 6th, and when his deal expired, the Cowboys placed another 5-year pact on him at $19m that runs through the 2015 season, although there are not enough guarantees on it to assume he will play 11 seasons here unless his production remains at a level the Cowboys can live with. Honestly, given that his production has never been high, I am not sure what level of production that would be, but he is still here, and for that, the Cowboys celebrate. 2004: No 1st Round pick here due to trading back with Buffalo where the Cowboys drafted Julius Jones. Jones signed his initial rookie deal of 4 years and played exactly that. Then, to start his 5th season, he relocated to Seattle in free agency with the Cowboys making no attempt to keep him. 2003: Terence Newman was given a very lucrative rookie contract followed by a $50m extension of which he did see a great portion of. It would be rather easy to admit that despite his drop off over the last few years, if you take a cornerback in 2003 and are still starting him in 2011, you have to be pretty satisfied with the overall bang for your buck. But, he did receive many of tons of those bucks for sure. 2002: Roy WIlliams was the 6th pick in the draft and signed to a 5 year deal. Then, before the 5th year, the Cowboys placed another 4 year extension on top of that at $30m that would run through the 2010 season. However, he asked for his release following the 2008 season when the writing was on the wall about his future in Dallas. 1999: Ebenezer Ekuban was selected out of North Carolina and was signed to a rookie deal of 5 years. He played out his contract and left as an unrestricted free agent that signed in Cleveland for the 2004 season. To the best of memory, there was no effort to re-sign him in Dallas. 1998: Greg Ellis was selected with the #8 pick from North Carolina and signed a rookie deal for 6 years. He then signed a 6 year extension in 2003 after a holdout and played through the 2008 season in Dallas completing 11 seasons. By just about any metric, he was a solid player and a successful pick. So, going back 15 drafts with data from 12 of them complete, of the Cowboys 1st Rounders, Greg Ellis, Terence Newman, and DeMarcus Ware would be considered hits. Marcus Spears and Roy Williams would be considered marginal but extendable. The rest would be considered mostly disappointments. Anthony Spencer still has a chance to change minds, but we will need more to his sample, as is the case with Mike Jenkins and Felix Jones who seem possibly to be wearing new uniforms by 2013. So, is Claiborne locking down corner for 10 years? Are Tyron and Dez ready to do the same? How about in 2015? 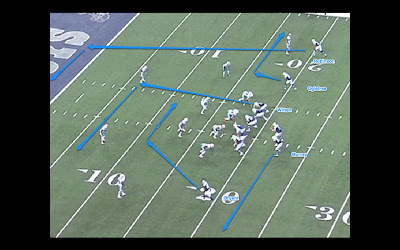 The Following is the 8th in an 11-part weekly series throughout the summer that will focus on the eleven plays that shaped 2011 for the Dallas Cowboys. Every game, about 130 actual plays happen and over the course of a season that number can exceed 2,000. But, we have selected 11 and will pick one each week and break it down from standpoint of "X's and O's" and see what we can learn looking back. The plays are not ranked, simply presented as the season unfolded. We hope you enjoy. One of these days, we need to find the short list of Tony Romo's top throws of all-time. There is no question that what we are about to look at is his best throw of 2011, but I need to reserve judgement on his entire career before I get too carried away. But, when you talk about improvisation, vision, arm strength, and execution, this particular Thanksgiving throw has it all. This drive put the Cowboys in a spot where they took over a football game that until that spot early in the 4th Quarter was proving to be extremely difficult. To see the entire drive broken down, I recommend you read the piece from last November that looked at the drive as a whole. It might have been the high-water mark for the offense for the entire year. It demonstrated their QB, who had a collapsed lung and broken ribs earlier in the campaign, taking a beating behind an offensive line that was susceptible to the pass rush and the blitz on a regular basis. It also demonstrates some strategy points that go back to last week as we discussed the performance level and chemistry between Romo and his elite tight end, Jason Witten. As fans, we obsess and focus on statistical findings about a given player and how those numbers match up with his contemporaries around the sport. Surely, 90 catches is always better than 80, and so on. But, I think this play can show us an important example of what Witten does to coverages which, in turn, affects the opportunities all over the field for his mates. And this, is where Jason Garrett has a design advantage that he is crazy not to use as often as he can when looking at route combinations all game long. This Miami win also gave Cowboys fans a result that has seemed somewhat rare in the last few seasons; one in which the team as a whole and the veteran leaders in specific had just refused to lose. Many things went very poorly in this game and mistakes were made in multitudes. But, in the end, the game was not going to be conceded. They were going to scratch and claw and get that 7th win of the season. As this game ended, with the Cowboys 7-4 after once being 3-4, it seemed relatively certain that this team was determined to fall into its same old familiar December pattern. But, we all know that it turned out that way yet again. More on that in weeks to follow. The Play: 1-10-MIA 18 - (14:37) (Shotgun) T.Romo pass deep left to L.Robinson for 18 yards, TOUCHDOWN. 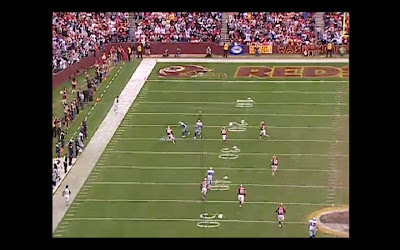 Pass complete on roll P15 left by Romo; ball caught back of the end zone. 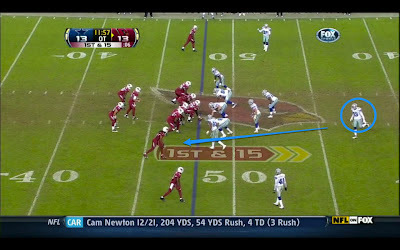 Click Here to see the play on NFL.com - And please remember to click on any of the pictures below to see them enlarged. It is S11 Personnel, which is Shotgun, with 1 RB, 1 TE, and 3 WR on the field. They have a 3 x 1 setup to the right, meaning that they have overloaded the right side of the formation with 2 WR and a TE. 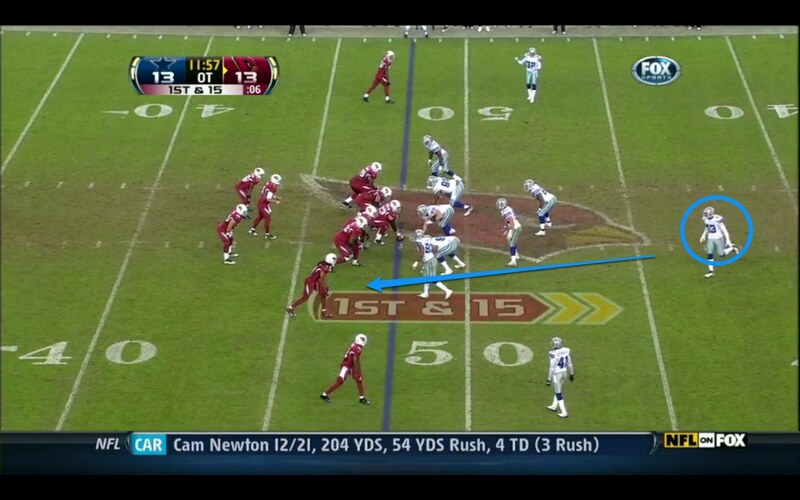 The only thing threat on the opposite side of the formation at the time of the snap is Dez Bryant. 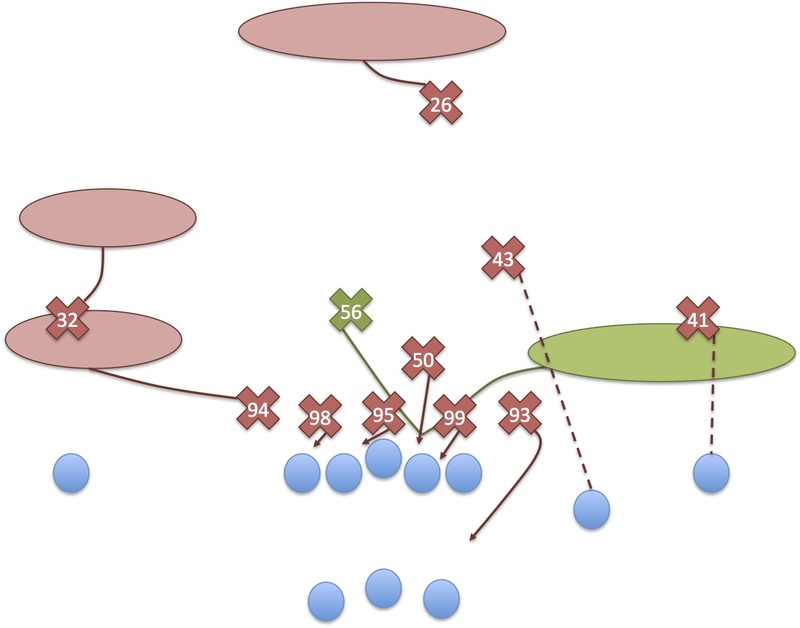 On this first picture, I wanted to overlay the routes for the play at the snap so you have an idea of what the plan is before the bullets start flying for real. They are pretty self-explanatory, but I did want to add something to Witten's description. He is really just running a basic 10 yard hook that he converts into a crossing pattern when he sees Romo break contain in the pocket. Much like last week, much of what Witten does on his routes are determined by glancing back in the pocket and knowing what his QB needs. So, know that his initial assignment is to run 10 yards and sit in an open area on a basic route he runs 10-20 times a game. Miami has a coverage that appears to be man to man on the edges with a zoning of Witten in the middle of the field and a single-high safety to decide where he is needed. 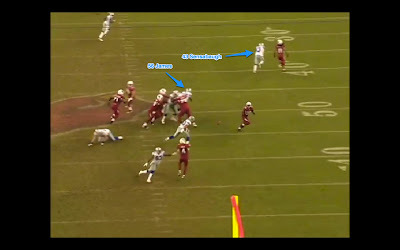 Yeremiah Bell is that high safety, and in Picture #2, you can see what he must read. 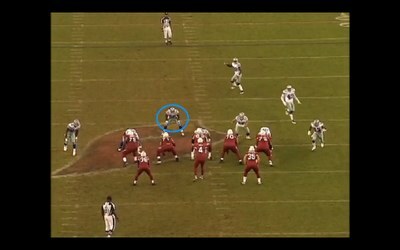 He is not concerned with Bryant who is on a crossing pattern or Ogletree who is on the sideline. 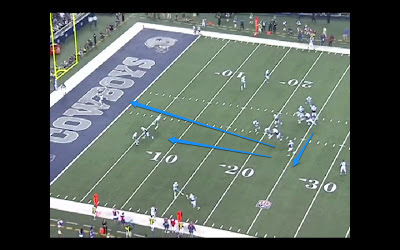 He has 2 reads which the arrows indicate: 1) Witten who is in front of him or Laurent Robinson who is headed for the post. 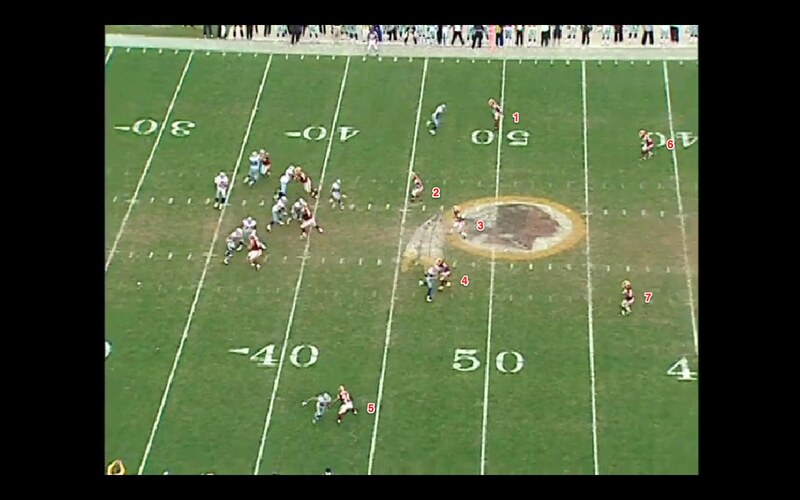 From a Cowboys perspective, you can see the spacing here really stresses a safety. 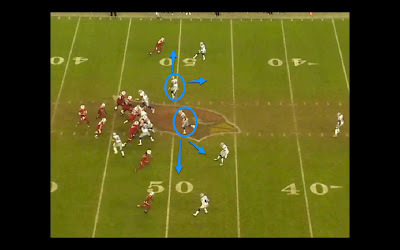 Witten is at the 5 yard line and Robinson is headed for the back of the end zone. Otherwise, they are headed in the same direction which likely is why when Romo bails out of the pocket, he wants to bail to his left which keeps those two in his throwing range. Much like last week, Romo is not very confident in his protection again. There is no reason to blame him, because he has taken a tremendous beating all season long, but the clock in his head does appear to be deceiving him a bit when he feels the pass rush before it actually seems to be arriving. Kendall Langford is pushing Doug Free back into Romo somewhat, but I cannot imagine that it was enough to force Romo out of the pocket unless he was looking for an excuse to bail. 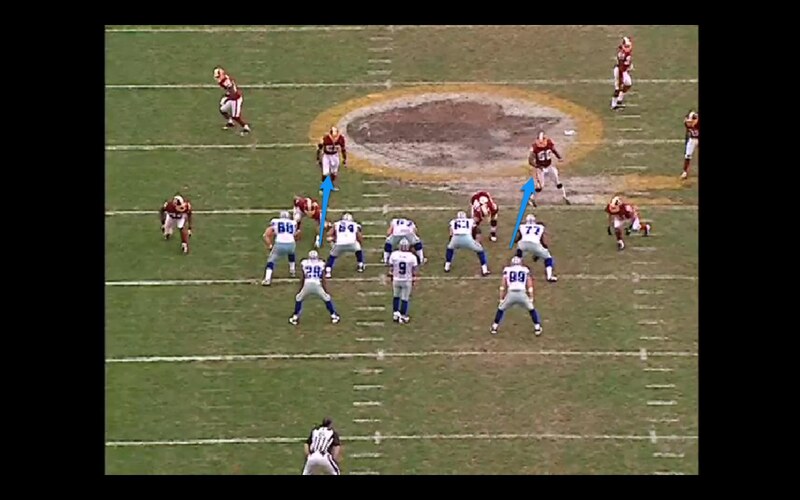 By the way, again, as you look at the similarities between this week and last week's throw in Washington, it is interesting to see left tackle being the spot where Romo looks most nervous. 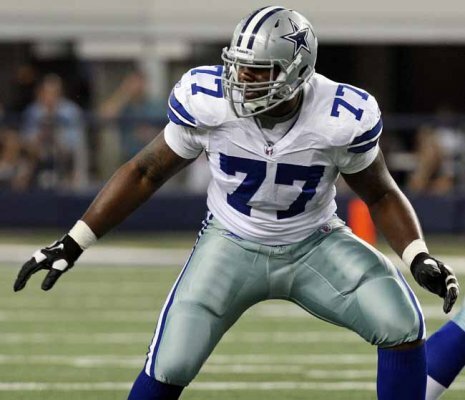 I wonder if Tyron Smith at left tackle will settle this down in 2012. 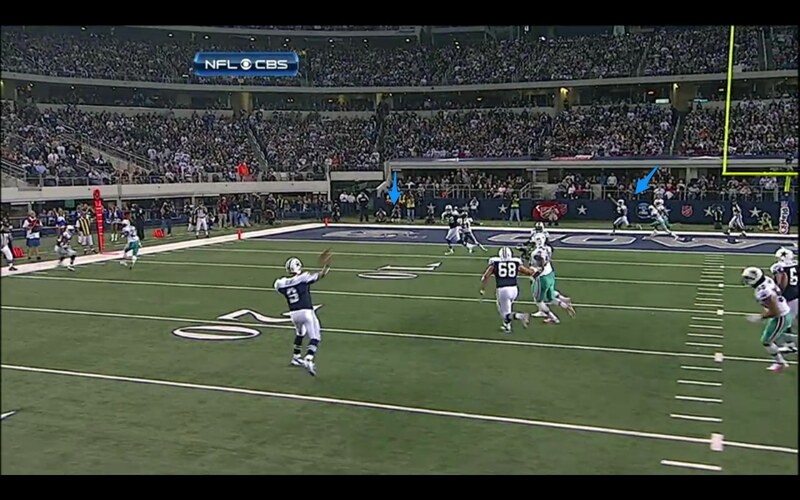 Picture #3 shows what Romo is looking at when he does break the pocket and sets his feet going to his left. There are only 2 reads that he is considering - the same two that Yeremiah Bell is looking at. Bell, the replay will show appears to have been paralyzed by the choice and ended up covering neither. 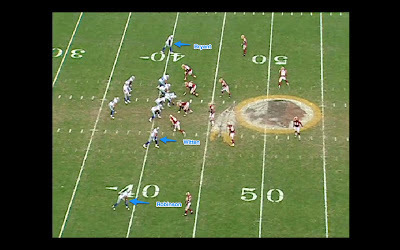 But, as Romo looks, he sees two players on Witten shallow and two more players on Robinson deep. Remember, it is 1st and 10. This might have been where he considers DeMarco Murray at the sideline or even a scramble, but clearly, he had other ideas. Now, it is time to throw the ball. In picture #4, you see the throw he has to make. 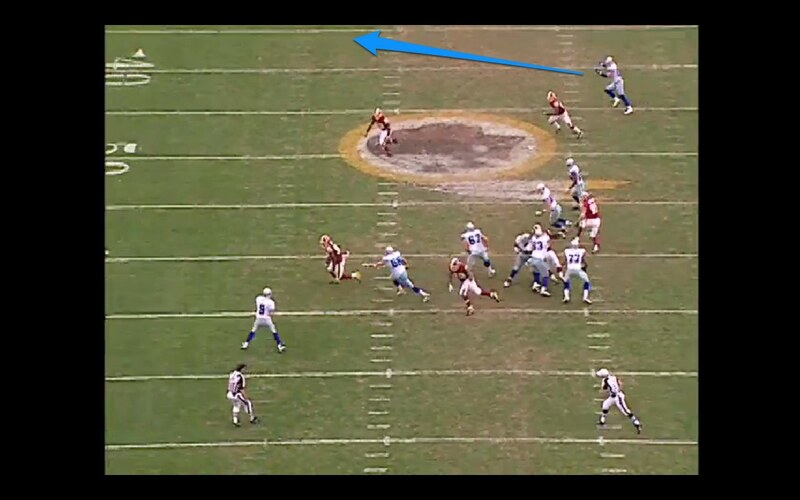 This is where Witten controls the coverage and allows others opportunities by his mere presence. 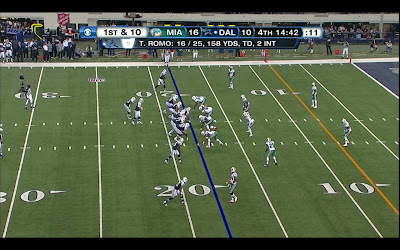 If you are a Dolphins defensive back, where do you think Romo is going with the ball when he breaks contain? 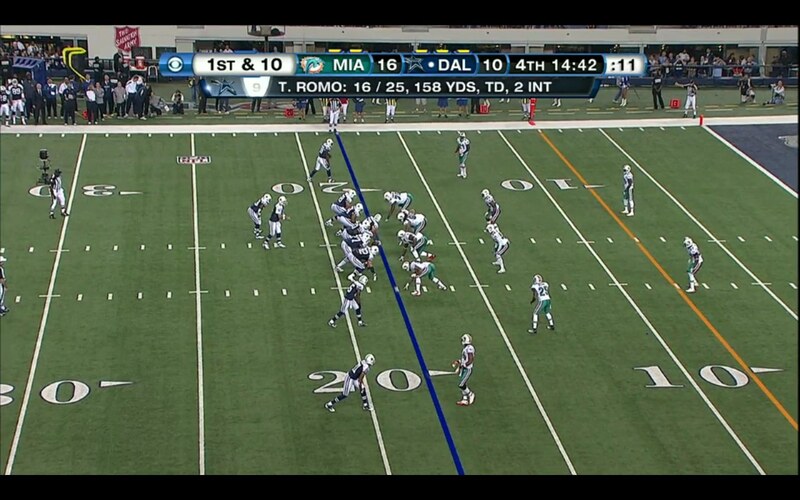 Remember, the Dolphins have been looking at the throw in Washington to Witten all week during their film study. It just happened 4 days prior. Robinson has a step on his man, but Romo has to lead him perfectly or risk an interception that would demoralize the stadium after a drive this long. What is interesting is that his throw to Robinson in the back of the end zone will have to basically go right over the head of Jason Witten and his defenders to get there. 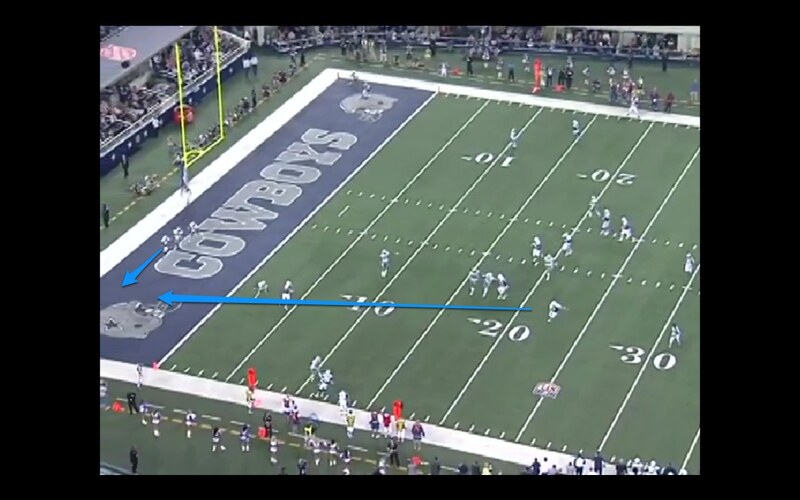 Witten might even think it is an overthrow initially, but Romo knew where he was going. When we discuss the "NFL Arm", this is what we are discussing. A 30-yard frozen rope to the sideline that must arrive on time. This, is a throw of great beauty. In Picture #5, I have placed 2 blue arrows. 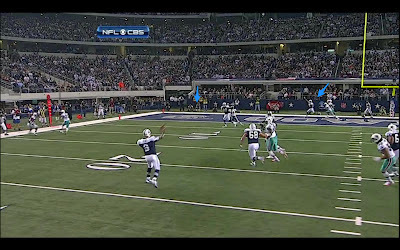 One is to show where Robinson is when the ball leaves Romo's hands and the other is to show where the ball will be caught. The throw is such that if thrown correctly, the only person with a chance to catch it will be the Cowboys' man. And it was executed to great perfection. The only argument on this throw would be whether it should have been attempted (which only gets asked if something bad happens). From this angle, you can argue that a throw to Witten is available that would have given a 1st and Goal if it was caught. But, keep in mind, Romo doesn't have time to study each frame and analyze this all over the course of an hour. He had 5.1 seconds from snap to throw. And, finally, the catch, which should not be oversold either. Robinson, for having such a short time in Dallas which included no preseason, had a wonderful knack of understanding how to assist his QB when the play breaks down. Some receivers have this knack and others don't. As I was pondering this play this morning, it reminded me of a play from a few games earlier against Seattle that utilized many of the same concepts. It is a different personnel grouping, but again, the idea is to stress the safeties with a high/low cross concept that uses Witten to attract coverage and slips Robinson behind him in the back of the end zone. Coincidentally, both of these plays from the two different games are the 2nd snap in the 4th Quarter and both end up as touchdowns to Robinson in the back of the end zone. The other players are trying to take defenders out of the middle of the field and leave Witten and Robinson for Romo to decide. Now, click here to see this touchdown against Seattle from NFL.com and see if the two plays remind you of each other. How the team seemed to be on such a good run in November but then collapsed some in December is what we must now focus on for our remaining 3 entires in this series. They had the schedule right where they wanted it until the calendar turned. The above quote was from the NFL Network's summer time-killing series, NFL's Top 100. I enjoyed the series quite a bit as a football nut trying to survive May, June, and July, but if you check it out try not to get caught up in the actual rankings. Just enjoy 5 minutes on players like Navarro Bowman and learn about guys that you don't know a ton about. Bowman, you might recall, was very highly ranked by the Cowboys in the 2010 draft and looked to be the player the Cowboys would have taken in the 2nd round if they had not grabbed his college teammate, Sean Lee. It looks like both Penn State linebackers in that draft are fantastic young players and Bowman is already thought of as a Top 100 player. Something Sean Lee will need to look forward to and build for next season. Anyway, the point of that setup was simply to introduce a new term to the blog that I want to pursue from henceforth. The concept of the "splash" play. Offense is much easier to consume and evaluate in my opinion with the resources we have available to us as fans and media. We can surmise much more by looking at the tv copy or the coach's film that is now available to all of us if we so choose to examine it (And, I most certainly do). But, on defense, we have much less clear and concise information with which to draw our conclusions. We are guessing coverages and responsibilities and overall are left to wait for sacks and interceptions to know if a player is getting it done. Therefore, when someone is asking how well someone is playing, we tend to suggest that DeMarcus Ware has 13 sacks and that is pretty much it. So, I wanted to broaden the discussion a bit with this idea of splash plays and then begin logging them on a game by game basis. It is certainly not perfect - in fact, it is quite subjective if we wish to rate plays on the basis of disruption or impact, but nevertheless, I wanted to introduce them to the discussion this season. If for no other reason, for years we have been "Decoding Garrett" and meticulously breaking down the offense, and many of you have asked for better evaluation of the defense as we travel through another Cowboys season. So, that is the plan in 2012. But, to get the system cooking, I am rewatching all of 2011. Each week, I will release our findings for 4 games and in a month we will have gone through all 16 games. We will have running totals and be able to update the season stats as we go. It is imperfect, and I generally don't like dealing in imperfect plans like this, but I want to give it a shot and see who is making the splash plays for this team. If Anthony Spencer can do many things besides sacks, let's count them up. If Gerald Sensabaugh is better than I think, let's see it. That is my plan. And, Bryan McCann, Danny McCray, Keith Brooking, Abram Elam, Terence Neman, Gerald Sensabaugh, Frank Walker, and Josh Brent each accounted for 1. That means Bradie James, Marcus Spears, and Orlando Scandrick had 0, but Scandrick missed all of these games aside from a short stint in the Jets opener before he was injured. Spears and James cannot use that excuse. They played all 4 games. Surprising to see Kenyon Coleman and Alan Ball making such an impact early, but we will grow our project next week with the next 4 games of 2011: The Patriots, Rams, Eagles, and Seahawks games. The events of the last few days in the life and times of Dez Bryant bring into focus one clear reminder that was front and center 27 months ago when the Cowboys went out of their way to select the talented wide receiver; That there was a significant risk to selecting him and if the Cowboys were to do so, they would have to ignore a number of red flags that many organizations simply were not willing to do. No team in the last two decades seems more willing to play with fire than Jerry Jones and his Cowboys. And while sometimes it turns out to be typecasting, stereotyping, or misinformation, other times it is Dez Bryant. Bryant, as the media has pointed out on a number of occasions in the last 48 hours, has never been arrested before. OK, that’s great. But, in the 27 months since the Cowboys have employed this young man, he has generated more headlines than the rest of the team combined. Reports of unpaid bills over here, and reports of a missed meeting over there. Questions about whether he knows the playbook and questions about whether he knows that very few good things can happen at 2 am in a nightclub. He is everything you hope to avoid when you are trying to run a football team made up of men. One of the complimentary phrases that is repeatedly used when describing a veteran who has his act together is that someone is a “pro’s pro”. It is reserved for the guy that requires no babysitting or maintenance. You signed a football player, and you received one. He is a man’s man and he takes care of his business without you gently waking him in the morning to insure that he will find the trainer’s room in the morning when he scheduled to do so. But, with Bryant, it is quite the opposite. Paying someone to usher him through life is exactly what they have done. He has missed countless appointments and has even been locked out of a team meeting for being late. He has not always been familiar with his assignments and has of course offered the occasional sideline temper tantrum to top it all off because he is not getting the ball when and where he sees fit. The talent is unmistakable. Of course, it is. For if it wasn’t, then why would he be worth this amount of trouble? Why would the team hitch their wagon to his train, living and dying on his big performances because they are so leveraged on making sure it works out. He gets into a domestic situation and instead of thinking things through as if any citizen just did what he is alleged to have done, we are left to wonder about the shallow nature of his position on the Cowboys’ depth chart. Fully realizing that if he or Miles Austin is lost for even a fraction of the season, the Cowboys fortunes could go up in smoke before they even leave the starting gate in 2012. I clearly remember the narratives of the 2010 draft. Locally, it was thought to be a given that Dez would be the Cowboys pick. Allegedly, Jerry Jones was still reminiscing about the “mistake” he made in 1998 when he didn’t take Randy Moss. Why was he scared off by the red flags? Why did the warning signs that Randy Moss would always be a high maintenance player who will sprinkle in many highlights with petulance and narcissism scare off the Cowboys? Why? We shall never make that well-grounded football decision about our highly compensated investments ever again. So, they assure themselves that David Wells and the team in place to “advise” (or sometimes babysit) the Bryant franchise makes it a worthy investment and rush to the podium by trading up to get their guy. And from draft day 2010 until today, it has always been something. Oh sure, this is first arrest. But, it is always something. Missed meeting. Missed treatment. Missed hot route. Missed autograph signing. Disagreement with the police here, disagreement with security there. Unpaid bills, contracts with clothing companies gone bad, lawsuits, and on and on and on. What has been interesting over the last 12 months or so is the frankness with which Jerry Jones and Stephen Jones have started speaking about Dez. They are more than willing to go to the media with challenges to the young lad to grow up and take care of his business. They have tried coddling and now they have adjusted it over to somewhat tougher love – at least in various interviews where they ask him to step up his game and career to the next level. Basically, to stop making them look silly and start making them look smart for believing in him. We have all been told countless times that by trade, Jerry is a speculator who made his fortune on seeing black gold in the ground (Wildcatting for oil) when everyone else looked at the same thing and saw garbage. He would gamble and not play carefully. He would push his chips all in and be the guy at the auction that would not be afraid to push the limits. He knew how to win big in high stakes gaming. And then, with great ease, he translated that to the football field. He showed one legend the exit and brought in a college coach when others talked about how that doesn’t work in the NFL. He oversaw the most lopsided trade and heist in the history of the National Football League. All he did is find success to the tune of 3 World Titles before 6 years had passed. Man, this gambling is working out great! He worked the system and understood how to get an edge. Then, the stains of public controversy started invading Valley Ranch and the winning stopped simultaneously. And from then until now, Jerry has been going in one big circle of trusting his gut, getting burned, changing his ways, not liking it, and going back to trusting his gut all over again. So, this version of gut-trusting is now Dez Bryant as Dez enters his 3rd season. He has delivered glimpses and an overall performance record that is actually quite reasonable given comparables around the league. But, the “it will always be something with this guy” prediction has come through as advertised. It is always something with Dez. If he was a model player, then you could get over his issues off the field (see countless examples). If he was a model citizen, you could get over his occasional issues on the field (see countless other examples). But, sadly, he is neither at this point. A guy who is not where he is supposed to be on the field when it matters most, and a guy who makes Jerry Jones cringe when the phone rings late at night. He can be as good as he wants to be. This is a cliché that is often used for this type of athlete. Blessed with the tools and intangibles to dominate at the highest levels, but not consistent or dependable enough in the way he sees life to ever fully realize it. And now, with rumors rampant about the Cowboys intentions when contract time arrives, we are reminded again why sometimes it makes good business sense not to gamble. When the rest of the NFL won’t touch a guy because of questionable character, maybe there is a solid reason or rationale. Maybe, because of some of these traits, he just will never be worth the trouble. Maybe, going against the crowd can go wrong. He can still be something special here in Dallas, but it seems more undetermined than ever before as these speculative projections of life with Dez have become a reality with each passing headline. And make no mistake, you visit with anyone inside the organization off the record and you will be assured that these issues are not a figment of the media’s imagination. Time will continue to tell, but if it continues at this rate, we will have yet another cautionary tale to put in the books about Jerry being Jerry and how that wildcatting is not always the best strategy in the NFL. Primarily for my personal use, I am have compiled a Dez Bryant news archive so that I can remember everything. I am sure not all of this is his fault (or is even newsworthy), but wow he can keep the media busy. I am attempting to keep this news archive to merely stories that are not directly related to catching the football stories. Feel free to remind me what I have missed, and I will add them if you email or comment a link. July 30, 2011 - Bryant started off on the wrong foot. He was late to the first team meeting of training camp. October 21, 2011 - At 2-3, Dez proclaims the Cowboys "unbeatable"
July 16, 2012 - Dez Bryant was arrested Monday by DeSoto police on a family violence charge. Of course owner Jerry Jones offered up cautious point in June when asked about Bryant’s incident-free offseason up to that time, "As soon as you note that, the next morning you’ve got one." 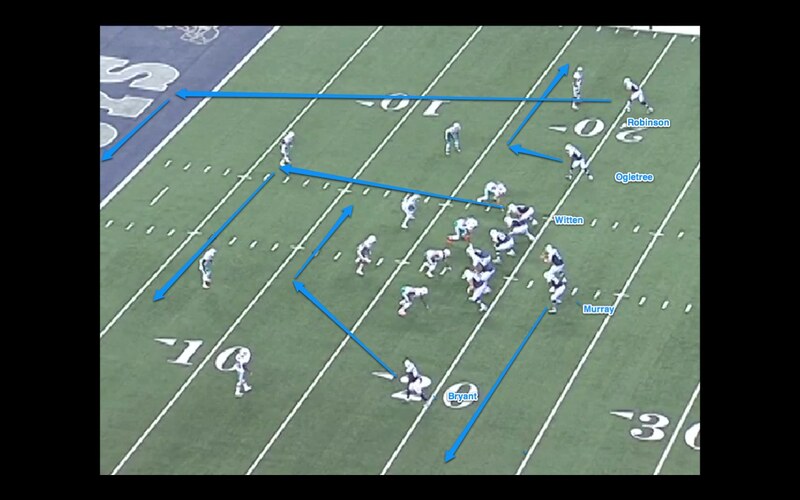 The Following is the 7th in an 11-part weekly series throughout the summer that will focus on the eleven plays that shaped 2011 for the Dallas Cowboys. Every game, about 130 actual plays happen and over the course of a season that number can exceed 2,000. But, we have selected 11 and will pick one each week and break it down from standpoint of "X's and O's" and see what we can learn looking back. The plays are not ranked, simply presented as the season unfolded. We hope you enjoy. The final 5 editions of this 11-part series take us down the stretch drive. The next 2 will be of the positive variety, and unfortunately, like the season itself, the final 3 will not turn out so well for the home team. This week, we need to spend some time on one of the elite players of this team. Jason Witten has been so elite for so long, that the level of appreciation for his week-in, week-out play almost gets lost in all of the noise of a Cowboys season. In fact, Terrell Owens, in his most disgruntled form, tried to use his chemistry and unspoken language with Tony Romo as proof of a clique in the Cowboys locker room that keeps the Cowboys from moving forward. Most informed people had a great laugh at that nonsense, but for the most part, Witten hasn't missed a beat as his Hall of Fame career marches on. At some point, his elite performance level will diminish as he has now passed his 30th birthday, but there seems very few signs of that right now. He has not missed a single game since his rookie year, when on October 12th, 2003, the Cowboys played the Eagles without Witten. Since then, he has played 143 straight games and has made an impact on plenty of them. As his career has been recognized, his numbers have continued to grow. In the 5 years since Jason Garrett has run the Cowboys offense, Witten has been featured over and over again. In fact, there are 10 names in the entire NFL that have more receiving yards than he does over those 80 games: Larry Fitzgerald, Roddy White, Reggie Wayne, Wes Welker, Brandon Marshall, Calvin Johnson, Andre Johnson, Greg Jennings, Steve Smith, and Marques Colston. You will notice that there are no tight ends in that list at all. Yes, other tight ends have had bigger seasons than Jason Witten. But, over the long 5 year sample, Witten's 5,071 yards and 444 catches are enough to put him atop all tight ends. During that span, Tony Gonzalez has 4,628 and Antonio Gates has 4,405. Witten doesn't get the same praise as those two, but he does get the results. This game, from Week 11, featured the 5-4 Cowboys trying to get their win streak to 3 consecutive wins in a division battle at Washington. The Redskins felt that they were robbed during the Week 3 battle in Arlington and now wanted to even the score back at their place. You might recall that Washington lost that game because Jim Haslett went off the coaching reservation a bit with 3 consecutive Cover 0 blitzes that finally got burned late on a Romo improv play to Dez Bryant. 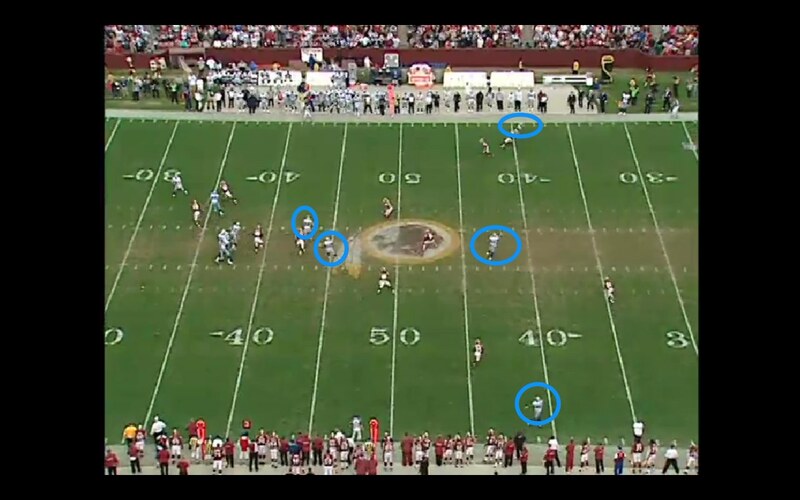 Why, on 3rd and 21, the Redskins blitzed everyone plus the kitchen sink makes coaches wake up in a cold sweat. But, he did, and he paid. And surely, he would attempt to right that wrong on this Sunday if things materialized. The Redskins started 2011 with a 3-1 record (the only loss to the Cowboys), but by this day in November, the Redskins would be 3-6 and eventually end the season at 5-11 for another sub standard year of football in the nation's capital. They had many talented defensive players and a unit that can cause many issues for their opponent, but the very poor QB play has been an issue for a long stretch in Washington. I am taking some license here at the writer to suggest that this Touchdown to Witten is the pivotal play of the game. Fans will recall that there were more than a handful of plays in this contest, including another long 3rd Down conversion to Dez Bryant in overtime (against who else? DeAngelo Hall) that put this game in the win column. But, given that this play was one of the longest touchdowns of the year and given that it features one of the central figures of this decade of Cowboys football, I elected it for this week's breakdown. The Play: Cowboys 17, Redskins 17 - 4Q - 9:01 - 3rd Down, 8 to go. 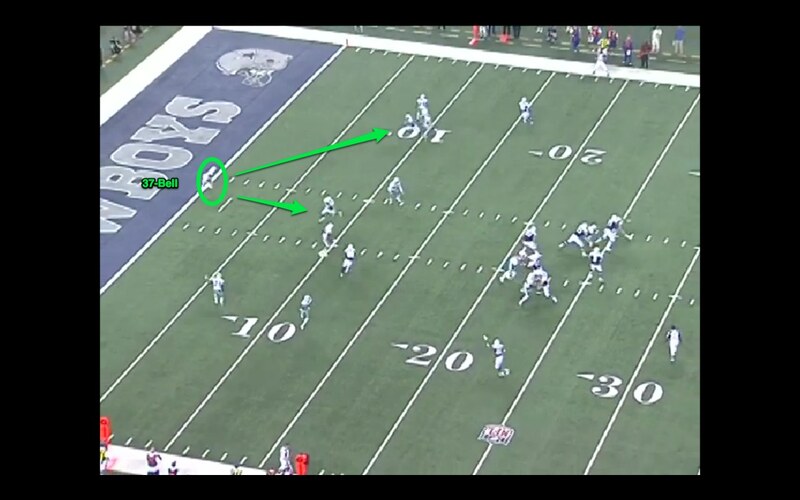 Ball at Dallas 41 - Shotgun 12 Personnel - T.Romo pass deep middle to J.Witten for 59 yards, TOUCHDOWN. To fully appreciate what we are looking at here, one needs to understand the cat and mouse game that Haslett and Garrett have been playing in these 2 games. There are 3rd Downs and there are high leverage 3rd Downs late in games that are close and hanging in the balance. As we examine both meetings, we see that it comes down to the Cowboys being a bit better both times, but hardly due to Jason Garrett's play-calling. Closer to the truth is the improvisational skills of Tony Romo. 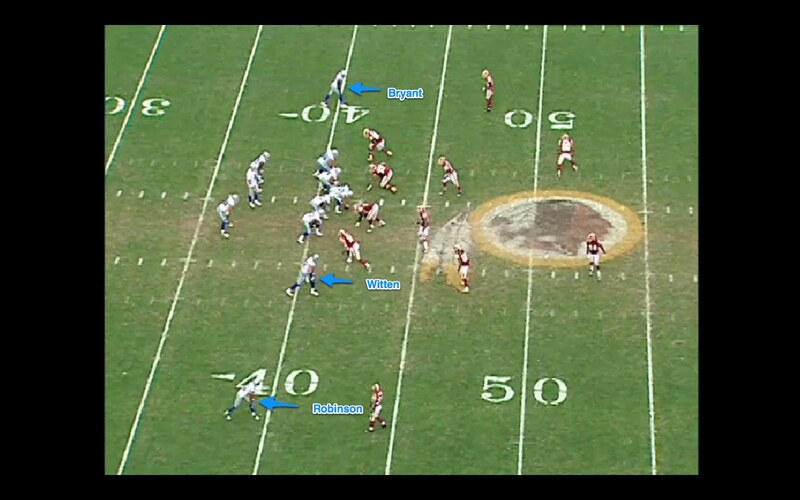 The other element very much at play here is the safety position of the Washington Redskins. Like their counterparts in Dallas, safety has been a bit of a revolving door over the last several seasons in Washington. Proof of that is that all 3 main players in a story from Game 10 of last season are pretty much out of the mix in Redskins-land for 2012. OJ Atogwe is now in Philadelphia, LaRon Landry is a Jet, and DeJon Gomes is buried well down the Skins roster. But, on this day, because Landry has been hurt the week before, Gomes was being asked to cover the deep secondary as a 5th round rookie. This would be the only day where he would play an entire game all season long. And on this play, the Cowboys would attack him. Otherwise, Gomes is known for 2 things: 1) he is the guy who made the hit when Adrian Peterson blew out his ACL and 2) he is often mistaken for Robert Griffin III. Click on all pictures to enlarge. Here in Picture #1, we can clearly identify the Cowboys S12 lineup, with Witten in the right slot, Laurent Robinson wide right and Dez Bryant wide left. In the backfield beside Romo, John Phillips is to the right and Felix Jones is to the right. In the 2nd picture, we count that the Redskins are only rushing 4 and dropping 7. We will see later in the play that this is actually rushing 3 and dropping 8, because Ryan Kerrigan will peel off and chase John Phillips once Phillips releases into a route. OK, inside the red circle below is the rookie safety, DeJon Gomes, filling in for the injured Landry. 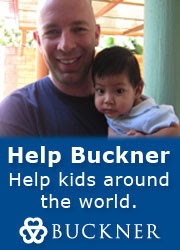 His responsibility is to provide over the top help to his half of the field. This will require him to read the deeper threat and either help to the inside with Witten or to assist to the outside if Robinson gets behind the corner on that side, which appears to be #34 Bryon Westrbook. Witten's curl route past the sticks (at the Dallas 49 yard line) is covered by several dropped linebackers, but as the play morphs into a sandlot play when Romo escapes the pressure in the pocket, Gomes will need to collapse down to Witten - something that he fails to read in time. In the frame below, we see the moment Romo has to make his final read. He has spun to the left of the pocket because he could feel Redskins' LB and sack artist Brian Orakpo collapsing down on Doug Free. One of Romo's trademark moves as a Brett Favre cover band is to spin back against a rusher from the left tackle side. It is human instinct to try to run from a pass rush, but as a QB gains experience, he learns how difficult that can be to outrun a edge rusher who is at a full gallop as he turns the corner. Instead, you can buy more time as a QB with the risky move of spinning left when a rusher is coming from your left. The reasons this is risky are obvious - but the worst part is that you must turn your back to your receivers as you spin if you are right-handed. 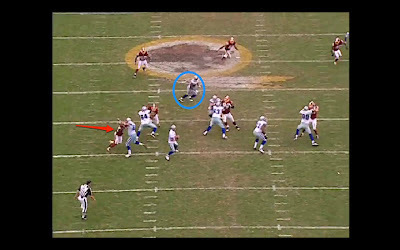 Now, Romo must re-find all of his targets and assess the field as Orakpo is closing down on him. He knows that it is 3rd and 8 so Romo is not considering the underneath options of Jones and Phillips who have both released when they saw the Redskins zone drop. Now, let's go back to the pre snap and look at the play again from the end zone camera that the coaching staff will use to determine the roles of the pass protection group and the quarterback. 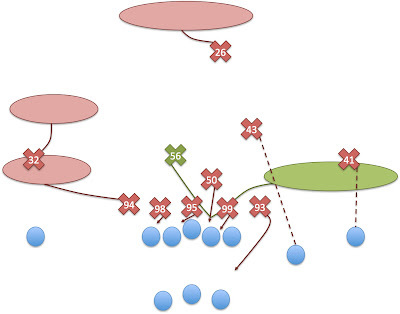 The two arrows show Felix Jones and John Phillips locking on to their primary blitz pickups, or more specifically, the players that will determine their duties for this play. In the event that the nickel defense of the Redskins on 3rd and 8 turns into a blitz, Jones and Phillips will stay put. This is often called "check - release". They check those two players to see what the plan is, and then release into the flats if there is no protection required. In 2010, Chris Gronkowski was fooled on the play that Romo was injured in because he checked the LB, released, and then the LB came on a delay rush and broke Romo's collarbone. To be clear, those two inside linebackers will not necessarily be the primary responsibility of Jones and Phillips. But, rather, if those two blitz, Jones and Phillips will stay in to be a part of the protection scheme. Phillips will now chip Kerrigan - 91 who is rushing on Tyron Smith, whereas Jones will now head out the "A gap" into the middle flat. Below, Picture #6 corresponds time-wise with Picture #3, above. 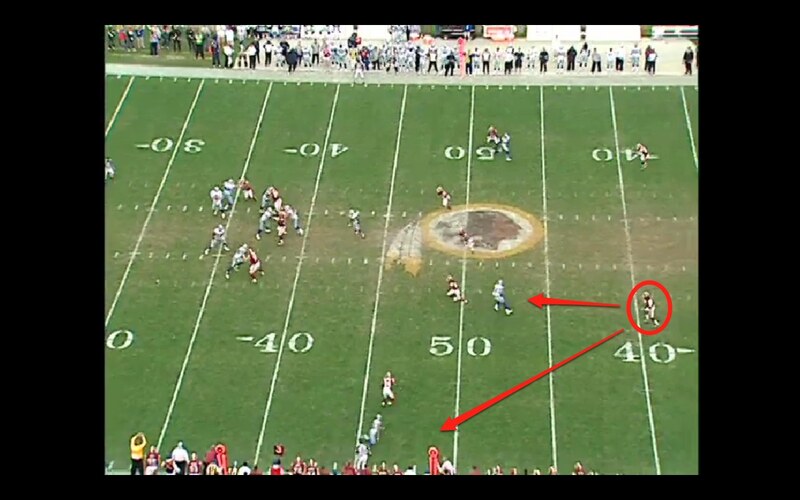 At this point of the play, Romo has but one option that is open. That is a quick dump off to Felix Jones (blue circle). But, with the score 17-17 in the 4th Quarter, Romo is not willing to accept a punt right here if he can help it, and a dump off the Jones 5 yards short of a 1st down with 2 linebackers ready to get him to the ground. Meanwhile, we put a red arrow on Brian Orakpo, who has Doug Free backing into Romo, and he also has Romo's full attention. Whether he is in actual danger or not, Romo is now spending more time thinking about his left tackle than he is thinking about potential targets downfield. OK, now Picture #7. This is a spot that there is simply no coach of a young QB that will authorize this type of evasive action. I am guessing most coaches would scold his QB for bailing out of the pocket this quickly, because fundamentally, Romo was not in so much trouble here that he had to bail out. 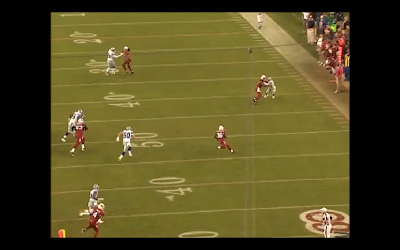 But, he did, and because he did, this 5 yard pass from Jones turned into a 59 yard touchdown to Witten. In this picture, while Witten is using the opportunity to head for green grass that is not being watched by Gomes the safety, Romo has his chest facing the opposite end zone. But, this unconventional maneuver buys him another second, which is what the play calls needed. Most right-handed QBs do not throw very well running to their left. The reason is that it is quite difficult to be able to square your body to throw to most of the field. When running or scrambling left, the only throw that is easy to pull off is to the left sideline. Otherwise, you have to square your body and that takes time and space. Romo does so in Picture #8, and this is where we discuss the rookie safety Gomes again. Picture #8 corresponds time-wise with Picture #4 and in that frame, you can see that Gomes does not make a veteran decision. This is his first game of starting in the NFL and it shows. 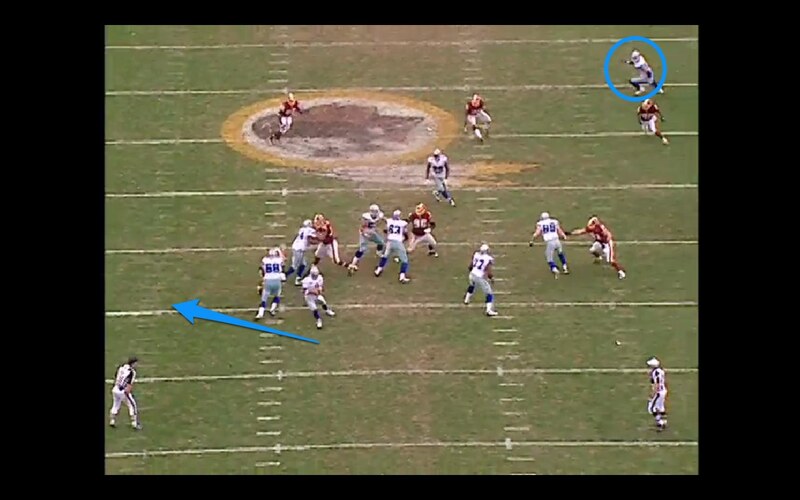 What he should have done is realize that Laurent Robinson is no longer a threat once Romo bails to his left. That would now be classified as an impossible throw from the left flat to the deep right sideline. It either cannot be done or if it can be done, you make them prove it. Gomes had to peak up to see Romo spin left and when that happens he has to dive down on Witten quickly or this is going to be a problem. Once he doesn't, Witten knows where Romo needs him to go. This is where chemistry and unspoken knowledge of what the other is going to do comes in handy. 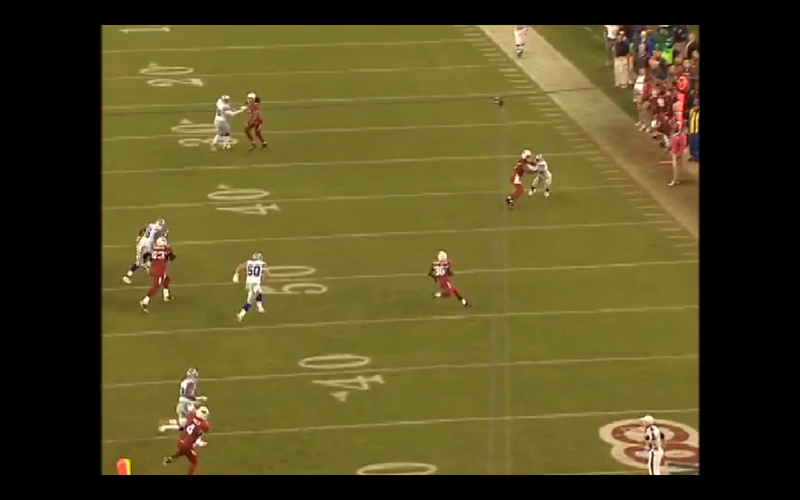 Witten knows to convert his hook route into a deep in that is beyond the middle zone defenders. And Romo is locked on just one guy. Why? Because they know where each other will be. And that should never be described as a bad thing when a play has broken down like this. In #8 and #9, you can see what else Romo is dealing with. You can see that Orakpo has now readjusted his sights on Romo and after the spin, no longer has to go through Doug Free to get to him. So, as Romo is setting his feet and squaring his shoulders, he is also seeing an unblocked Orakpo closing in at a rapid rate. The throw looks easy if you consider the blown coverage, but if you consider the fact that this throw is going to include a painful ending, it gets a little more difficult. 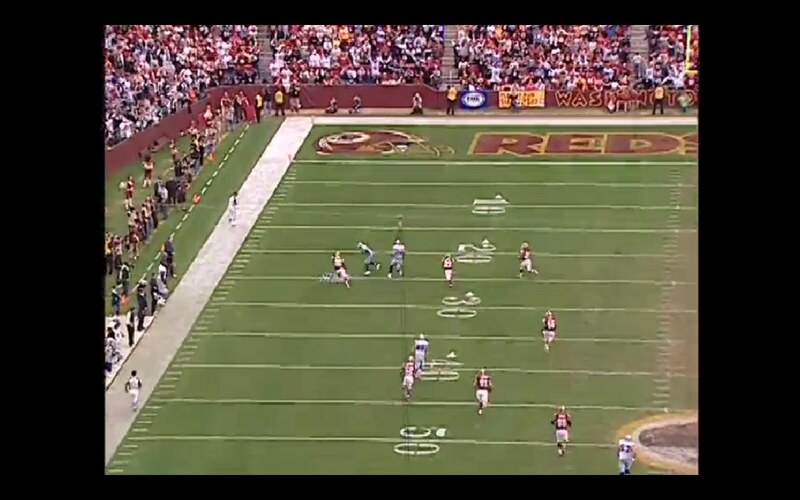 In picture #9, the ball is gone and if Witten catches it, he will be able to run for a while. 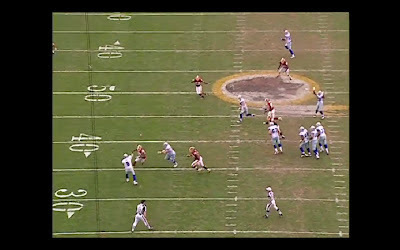 Finally, in Picture #10, we see that Witten can still pick them up and put them down at a rapid rate. His foot speed, which never gets brought up enough, is still such that he can race 3 Redskins defensive backs to the end zone from the 25 yard line, and they can not catch him. Touchdown. This play, which can be seen on video here is another sign that most of Romo's decisions turned out very well last season. He really played a high level, despite the fact that the network shows will repeatedly rerun those plays where he did not make sound decisions against the Jets and Lions. In fact, his last interception against the Lions in that gutting loss was a situation where he thought Witten was behind the linebackers and the safety had busted, too. 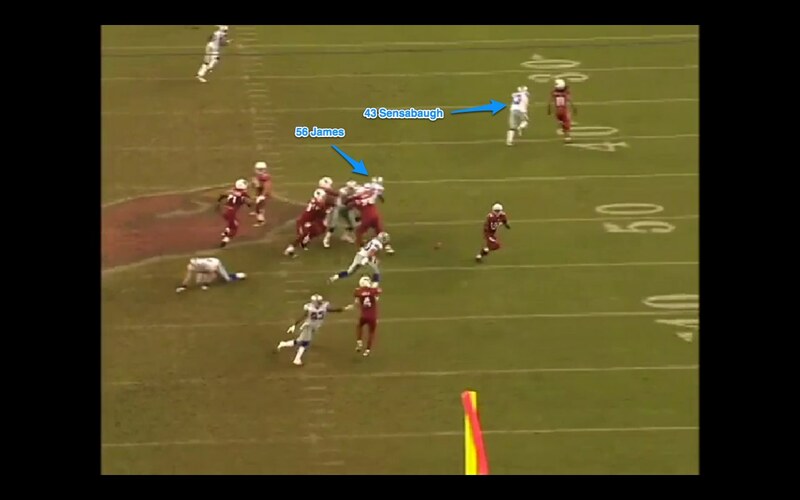 But, on that play, he could not plant his feet and make a good throw so it was picked off by Stephen Tulloch. But, when you look at Romo's best plays of the season, you see that so many of them come off plays where he makes something out of nothing. When the group of people that look forward to a new, young QB to replace Romo speak up, I wonder if they realize that the next guy likely won't have improvisational skills like this guy. I get tired of the endless discussions of his mental makeup and whether he can ever "win the big one", because so much of that is out of his control. But, in the simple talk about whether or not he can defy Xs and Os and make plays to win a game, Romo never gets enough credit for what he can do in plays like this. This was simply a QB who found a TD on a play that called for a 5 yard dump down to Felix Jones. And it certainly helps to have a tight end who knows what to do and when to do it to offer a security blanket when things break down. Romo to Witten has been quite a combination around here for quite a while. And, no Terrell, there is nothing wrong with that at all. Witten from Bob Arnold on Vimeo. 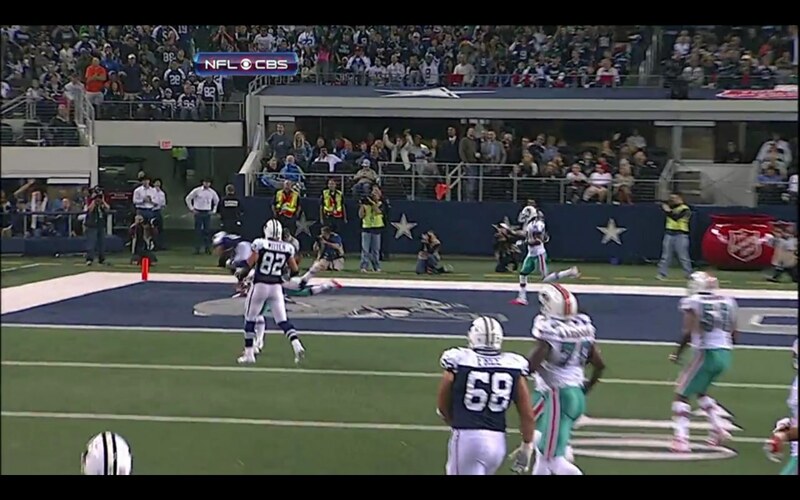 Next week, another Romo improv gets an amazing TD against Miami.